Join us for our regularly scheduled work days - We meet twice a month, generally every 1st TUESDAY and every 3rd WEDNESDAY, so mark your calendars. Tuesday, April 2, 2019, is our next regularly scheduled work day, beginning between 8:30 and 9 am - to weed, snip, plant and enjoy the camaraderie of our fellow gardeners. Join us - you'll enjoy it! Our second work day in April is scheduled for Wednesday, April 17, 2019. Fill in the Volunteer Form to let us know you are coming or just show up with your garden tools! ​ Come anytime to enjoy the peace and quiet this garden will bring you. See our updated Butterfly Garden work day pictures. History of the Garden: The restoration and expansion of the original Butterfly Garden was GOE's first community project. A Butterfly Garden was created many years ago, located in Summerfield Community Park, 6402 Lakewood Ranch Blvd. (just south of SR 70, adjacent to the now empty LWR Information Center), in Lakewood Ranch (LWR), FL. ​The original plaque explains how the garden came to be and can still be viewed in the garden. 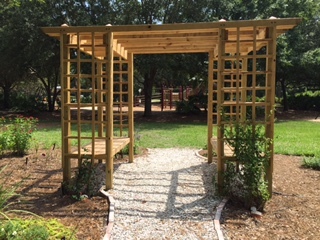 The LWR Community Development District 1 (CDD1) Board of Directors approved the restoration of this garden; GOE worked in conjunction with Ryan Heise, former Director of (LWR) Operations, to have most of the remaining overgrown plants and weeds removed, the soil conditioned, the trellis built and the shell path installed. The garden was planted with the help of students from the Pinnacle Academy. Our Master Gardeners created the garden layout after researching what plants attracted butterflies. Many thanks to Norma Kisida, GOE Master Gardener, who took the lead on this continuing community project. On March 2, 2015, Gardeners Out East (GOE) completed the restoration of the butterfly garden. The garden dedication took place October 17, 2015. See some pictures from the dedication. "In loving memory of Brian T. Lambert, a devoted father who cherished every moment outdoors." 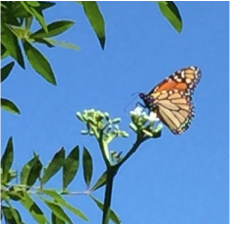 In Mr. Lambert's final days, the family found much peace and solace in the butterflies which gracefully fluttered outside in a beautiful butterfly garden. See how the Garden and the Trellis has developed since June, 2015.